Although European wood engravers produced prints with religious themes as early as the Middle Ages, the sending of greeting cards at Christmas truly began during the Victorian Era and is one of the youngest yuletide traditions. Christmas cards were introduced in England in the 1840s. Their forerunners were the letters (known as "Christmas Pieces") written by schoolboys being educated away from home who would send seasonal correspondences to their parents. The letters, written on special paper with elaborate engraved or printed borders and headings, were adorned with scrolls, flourishes, Biblical scenes and flowers. The writing of these letters gave the boys an opportunity to display proof of their penmanship and progress they had made in the art of writing throughout the school year. England's penny post, by which a letter could be sent anywhere in the country for only one penny, helped to accelerate the use of Christmas cards as a holiday greeting. 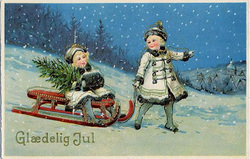 Commercial production of cards took on growth in the 1860s in England, but Christmas cards were not introduced into America until the 1870s when Louis Prang, a German emigrant, opened a small lithograph store in Roxbury, Massachusetts. There, Prang began producing his first samples...simple flower designs with the words "Merry Christmas." By 1881, Prang was producing five million cards a year and was following the practice of English printers who offered substantial prizes to artists for their best designs for the cards. Many of the winning entries depicted the Nativity and other Biblical scenes. These works helped put religious significance, previously lacking, into the cards. By the Twentieth Century, the Christmas card industry had ballooned with estimated annual sales of three-and-a-half billion to four billion cards. Statistics indicate that each American family exchanges an average of 60 cards each holiday season. Thus, in a little over a hundred years, the sending and receiving of Christmas cards had become a firmly-established tradition. 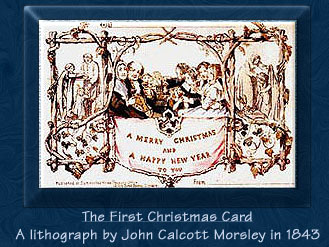 There is, however, some disagreement regarding the actual identity of the creator of the very first Christmas card, though many believe it was probably a narrative painter and member of the Royal Academy of Art named John Calcott Horsley, and that the inception of the now-familiar custom happened in the following manner. In 1843, Sir Henry Cole (who worked for the British Postal Service and was the first Director of London's Victoria and Albert Museum), finding that he lacked sufficient time to write personal greetings to all his friends, asked Horsley to produce a card. The card was lithographed in dark sepia on stiff cardboard (5-1/8 inches by 3-1/4 inches) and depicted a Christmas tableau framed in three panels. The center panel portrayed a family party in progress with children, parents and grandparents seated around the table...some raising their glasses in a toast. On either side, were panels depicting acts of Christmas charity: to the left, feeding the hungry and to the right, clothing the naked. Beneath appeared the now familiar phrase: "A Merry Christmas And A Happy New Year To You." That year, 1,000 of Horsley's Christmas cards were placed on sale in London. Printed by Jobbins of Warwick Court in Holborn and hand-colored by a professional in the trade named Mason, the cost of a single card was one shilling. An original of this card is considered extremely rare, but copies of a facsimile reprint issued in 1955 may still be found with relative ease today.